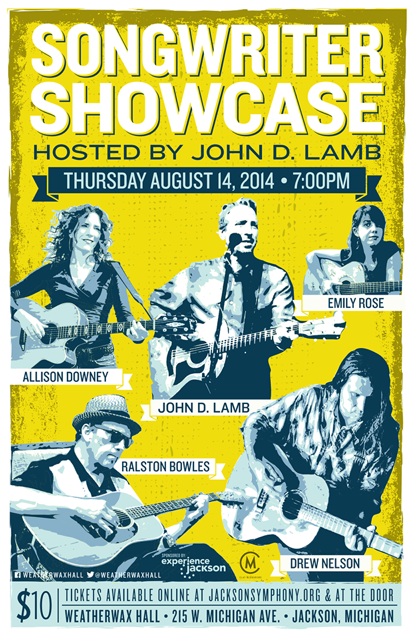 THIS Thursday, 8/14 7pm: Lamb’s Jackson Songwriter’s Showcase, Weatherwax Hall, Jackson Symphony Orchestra, 215 W. Michigan Ave., Jackson, MI. Thrilled to share the stage with these amazing songwriters: Drew Nelson, Ralston Bowles, Emily Rose and our host, the incredible John D. Lamb! AND what a great venue (Weatherwax Hall) in Jackson, MI. Hope you can come! Address: 215 W. Michigan Ave. 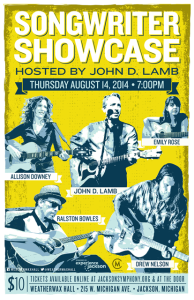 This entry was posted in Events, Music, News and tagged Drew Nelson, Emily Rose, John D. Lamb, Ralston Bowles, Songwriter, Weatherwax Hall by Allison Downey. Bookmark the permalink.